The slimy but savory reason why I love Paris. For the sweet reason, please click here. The soft texture of the snails and their woodsy flavor just go so well with the garlicky parsley butter mixture. They are simply delicious and irresistible! Yum!! Escargots de Bourgogne!! C’est mon préféré aussi! Lovely photo!! Makes me feel like I want to be in France now. I haven’t had escargo in ages. We eat them in Guyana too. Love the escargots picture. Yummy. I have never tasted escargots before, would love to try them some days. By the way, are they cooked using live snails or frozen or canned snails? Do you know? Never tasted escargots. 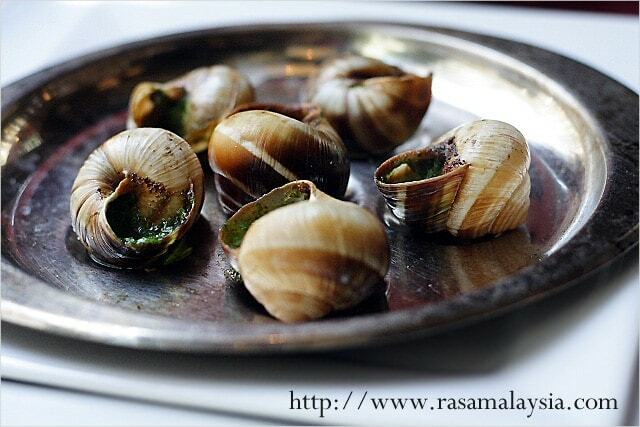 Do they taste anything like our local siput? I saw some similar shells – dad collect sea shells, but not sure if they are escargots’s! I need some siput now!!! ops… OMG… if Huat Koay’s wife saw this… trust me.. she will jump up the tree…. I am Tham Ciak. Nice meeting you and your blog..
mmm. i love escargot. these are beautiful! You are in France right now? oh i LOVE escargots too. i know some people, my husband being one, don;t like them. but i agree the parsley butter, plucking them from their shells…gulp! In Penang we can only get balitong in some coffee shop stalls. The one along MacAlister Road is nice. That’s the only type of snail available here.